Canada’s most festive city is easily navigated with parks, public markets, first-class restaurants and celebrations throughout the year. 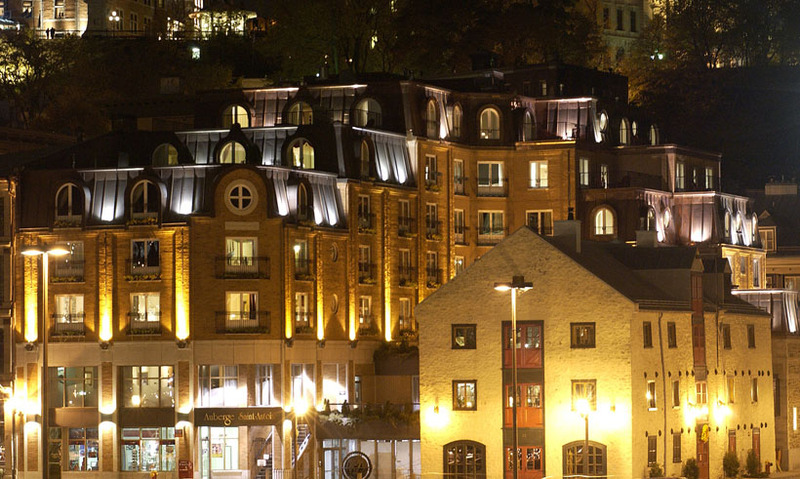 Auberge St-Antoine is a lovely boutique hotel on the riverfront in the heart of Old Québec in a historic wharf district built in the 17th century. 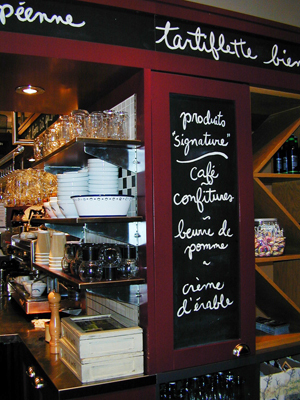 The eclectic shops and cafes of Rue St-Paul are less than 300 yards away. Contemporary comforts in rooms and suites include goose-down duvets, large work desks and heated bathroom floors. Over Wednesday-night cocktails in the hotel’s Café Artefact , we met the Antoine’s charming owners and learned of the hotel’s history as a glass warehouse. Colorful, delicately fluted glass fragments and reconstructions glow with new life as “modern” art installations in illuminated wall boxes throughout the property. We sampled hors d’oeuvres of fresh scallops with local cranberries, typical Quebequois paté and local cheeses. The St-Antoine also has an outstanding restaurant, Panache, where we enjoyed a five-star meal prepared by chef François Blais. Standouts included tender pumpkin gnocchi, baby field greens, followed by a whole roast suckling pig. The Quebequois really know their way around a locally sourced feast. For breakfast, try the poached eggs and spinach in puff pastry, topped with a sail of dried prosciutto. It’s not health food, but it’s delicious! 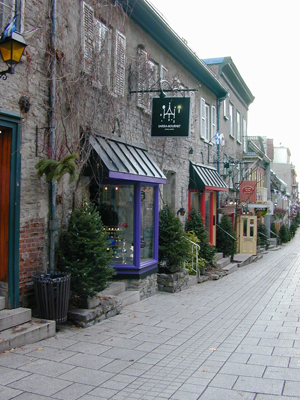 Old Québec’s “Lower Town” encompasses the Old Port district. Around the corner is the impressive Museum of Civilization, designed by the great Moshe Safdie, where visitors can take in the History of Quebec from beaver trapping to Margaret Trudeau’s miniskirts. Nearby Place Royale is charming small square with Notre-Dame-des-Victoires and the restored Quartier du Petit-Champlain. We enjoyed a little retail therapy at the upscale boutiques and cafes along pedestrian-only Petit-Champlain. The “Upper Town” overlooks the St. Lawrence River from a windy bluff shared by the Château Frontenac, Notre-Dame Basilica, and the Québec Museum. Have a glass of wine or cocktail in the Château Frontenac’s wood-paneled bar. With flags and stone turrets, the imposing old hotel evokes a romantic European castle. Although the city’s boutique hotels offer upscale comfort and convenience, visitors must experience the Frontenac. Savvy travelers can navigate between Lower and Upper towns by the cliff-side funicular at the north end of rue du Petit-Champlain. Ambitious climbers can also take the stairs. We hailed a cab — it’s nice to have a choice! The newly revitalized neighborhood of St-Roch houses some of the city’s tastiest spots. 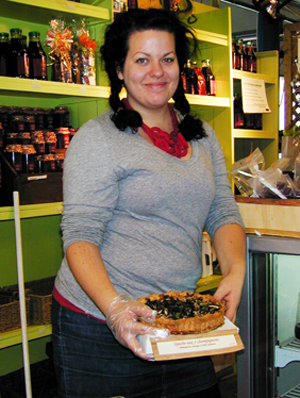 Rue Saint Joseph is chock full of bakeries, coffeeshops, charcuterie and cheese shops. Got a hankering for smoked duck breast, flaky croissants or chocolate? You will find them here. Renovation of neglected industrial buildings lured artists and businesses to the neighborhood, which is now a trendy work in progress. We walked off an afternoon of artisanal beer-tasting at popular local micro-brewery, Korrigane Brasserie, with a refreshing walk back to Old Quebec. Or enjoy a tasty to visit to Le Marché, a covered market in the Old Port, where visitors and shoppers stroll past overflowing displays of fresh cheeses, vegetables and fruit—and delicious goose pate. 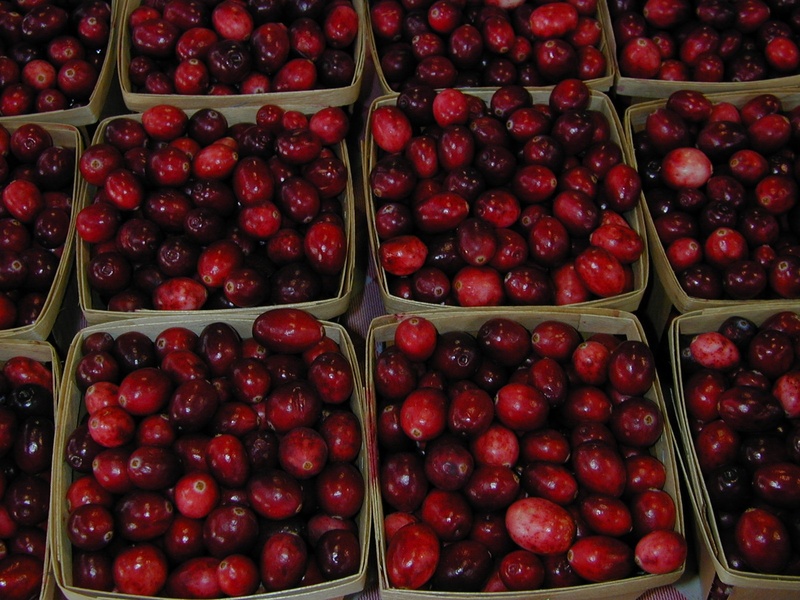 Much of this beautiful fare comes from the beautiful Ile d’Orléans, an easy and delightful day trip from Old Quebec. We found L’Isle an unspoiled oasis of maple groves, orchards, farms and stone chapels. We sampled wines, maple syrup, fruits and berries, cider and more. 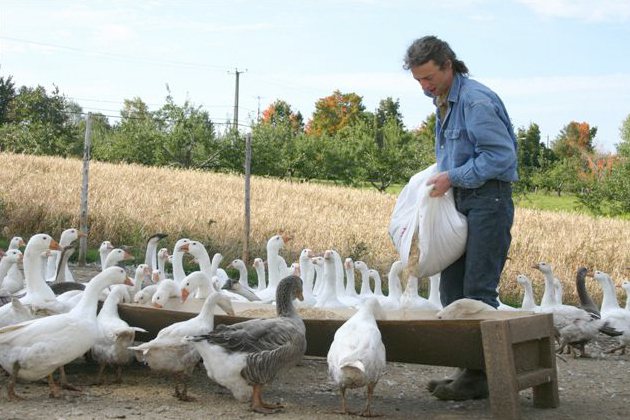 A highlight on L’Isle d’Orleans was lunch at Au Goût d’Autrefois, an authentic 200-year-old farm famous for organically-raised geese, ducks, guinea fowl, pheasants and wild turkeys. Their rillettes, foie gras, and confit of duck breast were delicious – fresh and succulent ­– served in the historic setting of a rustic family farm. We had a delightful visit to the sugarhouse “L’En-Tailleur” where more than eight generations of the Tailleur family have lived and worked. Nestled in the heart of the village of St-Pierre in the serenity of the island’s woods, the traditional maple-sugaring operation delights visitors with rustic authenticity and charm. 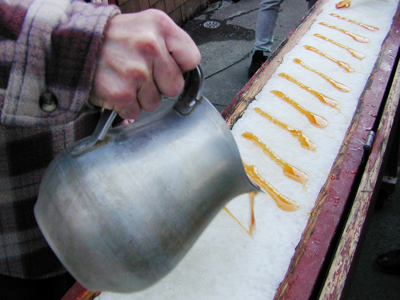 Enjoying sweet maple-sugar candy made in snow, we felt transported back in time. 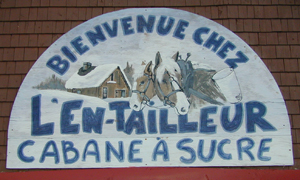 The city is almost entirely French in spirit and language, but never fear, residents know some English. We found that the gracious Québécois goes out of his or her way to communicate. UNESCO proclaimed Québec City a World Heritage Treasure in 1985, and we agree. Its narrow cobblestone streets are chock full of French civilization, history, culture and charm – enjoy! The Québec City Region was named the best cultural and exploration destination by travellers who consulted the TripAdvisor website. This entry was posted in Food and Wine, Travel and tagged duck, epicurean travel, fresh, fresh market, Frontenac, goose, gourmet, local, Old Quebec, organic, pheasant, saveur. Bookmark the permalink.